The Target Saver: Swagbucks: My GiftCardsPlus Summer Travel Promotion! Swagbucks: My GiftCardsPlus Summer Travel Promotion! If you're planning ahead on your summer travel, MyGiftCardsPlus is a great way to plan smart. You buy gift cards there and get cash back (in the form of SB points on Swagbucks) for your purchase! 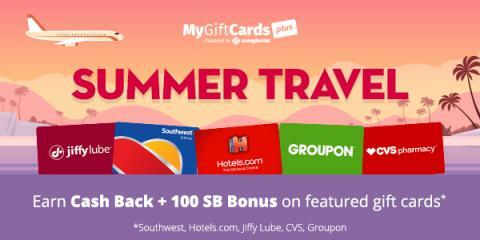 Since Summer Travel season is coming up, they're running a special Summer Travel promotion where you'll get a $1 (100 SB) bonus when you get a gift card for Hotels.com, Jiffy Lube, Southwest, CVS, and Groupon gift cards! Click here to get started! If you're not a Swagbucks member yet, you'll be able to join first so you can get your points from your purchase on MyGiftCardsPlus and then redeem them on Swagbucks for MORE gift cards to places like Target, Amazon, Starbucks, or PayPal cash!